Buy San Juan and PriceWatch, Buy this board game at the Lowest Price. Puerto Rico was an economic strategy game that transformed the board gaming world in 2002, introducing gameplay concepts that revolutionized the way games have been designed since. Its impact is still felt nearly a decade later, and is still ranked as the top board game on BoardGameGeek. San Juan is a card game derived from this revolutionary board game and designed by the same creator Andreas Seyfarth. It provides nearly the same amount of depth and strategy while making the game shorter and more fast-paced. In the game, you transform a sleepy Caribbean town into an economic and industrial powerhouse in San Juan, the card game based on the award-winning Puerto Rico board game. Race against your fellow colonists as you strive to buy up plantations and mines, and build industrial, commercial and government buildings. Become the dominant power behind the economy of this tropical paradise and show the world who is in charge of the island! 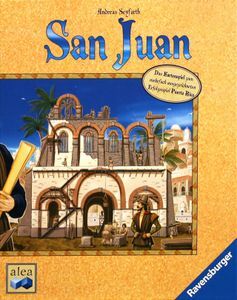 The goal of San Juan is to accumulate the most victory points by the end of the game, which occurs when any player constructs 12 buildings in his estate. The buildings you construct are worth a range of victory points, with some buildings providing a varying amount of victory points depending on how well you meet their required conditions. Your objective is therefore to build as many efficient buildings as possible and accumulate victory points faster than your opponents. However, you can't just simply construct any building cards you get your hands on. Each building has a construction cost, with the more expensive buildings being more powerful and worth more victory points. Similar to other card games like Race for the Galaxy, this cost is paid by discarding other building cards from your hand. So, playing a 4-cost building will require you to discard 4 other building cards. As you can see, constructing buildings will quickly deplete your hand. There is also a time and place for everything. Similar to Puerto Rico, actions become available when players choose roles. Every round, the starting player or Governor gets to choose a role to play. Once every player has played the action associated with that role, the next player gets to select a role. This continues until every player has selected a role for the round. The starting player position then moves to the next player and the role selection begins again. There are 5 roles in the game. When the Builder role is selected, every player gets to construct a building. When the Councilor is selected, every player gets to draw cards and choose one to keep. Selecting the Producer role allows production buildings to produce their goods, while the Trader role lets players sell their goods for more cards in hand. The Prospector role is slightly different in that it only allows the player who selects it to draw a card. Being the player who selects the roles also provides benefits. For example, the player that chooses the Builder role can build at a reduced cost, while the player that chooses the Producer role can produce an extra good. There are plenty of buildings in San Juan, each of which confer powerful abilities to help you win the game. There are production buildings that allow you to produce and sell goods such as sugar, tobacco and coffee. Selling these goods is crucial as it helps you replenish your hand with more cards in order to construct more buildings, or even to find a building you want to construct. Other buildings that change the game environment include the Aqueduct which allows its owner to produce one more good, and the Market Hall that gives you an extra card when you sell a good. There are also end-game buildings that have a variable victory point value. For example, the Palace is worth 1 victory point for every 4 victory points you have, while the Guild Hall gives you 2 victory points for every production building in your estate. Your goal in the game is therefore to construct a combination of buildings which will keep your hand constantly supplied with cards, and which mesh well together to provide an efficient path towards earning the most victory points. As San Juan is derived from the Puerto Rico board game, a comparison between the two would be prudent. The most obvious difference is the game speed, with a game of San Juan taking less than half the time of a Puerto Rico game. The resource system has also changed; in San Juan, rather than having a separate currency resource, the building cards themselves are also the currency. San Juan does not have the ability to ship goods or man buildings with colonists. The associated Captain and Mayor roles are therefore not present. San Juan instead adds the Councilor role which helps players cycle and draw cards. There are also a couple of other minor tweaks to streamline the game to fit a fast-paced card game. The game is an elegant and successful card game version of the best-selling Puerto Rico economic strategy board game, bringing to life the commercialization and industrialization of the sleepy Caribbean town. The game is quick and intense, and the gameplay is straightforward enough for beginners, yet has enough depth to keep experienced players entertained. San Juan is ideal for you if you like economic strategy and role-drafting board games such as Agricola or Puerto Rico, or similar card games such as Race for the Galaxy.